Yard, carport, patio, paths or paving in gardens, often using a layer of cement and coral. Some people admire its beauty, without knowing the name and how to make it. The surface of the concrete floor where given rock or coral on the top as well as stones fractions with a diameter of 2 cm to 5 cm is called brush concrete. It’s called brush concrete because a steel brush is used to accentuate the rocks. Sprinkles rocks above the concrete can be created with a variety of motifs or designs, depending on the desire of the maker. The pebble stones can just be spread without any pattern, either colorful or single color. Brush concrete’s function is to keep the road surface becomes not slippery, both for vehicles and pedestrians. 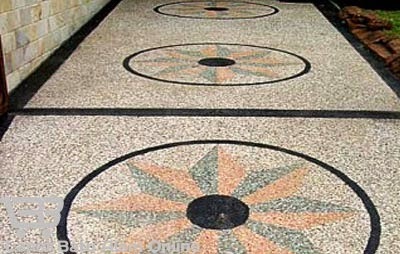 Many estates today are also using pebble stones for road materials inside the complex. Hotels often use brush concrete roads in front of the lobby. How to make a brush concrete is relatively easy. The basic ingredients used are cast concrete and coral or pebble stones. The making begins by covering the floor with cement as usual, then sprinkle coral on it. After a mortar rather dry, the surface that already sprinkled with stones is brushed with steel brush. If you want to create brush concrete walkways, the cement is printed with a particular shape - such as a square or a round- then sprinkle the pebble stones, and after a bit dry, brushed the surface with a steel brush.